Places to see at Galudi: Galudi dam, the rocky hills, Shalpial forest and landscape surrounding River Subarnarekha are the main highlights of this place. Nearby attractions from Galudi: The places you can visit from Galudi are Ghatshila, Panchapandav Mountain, Burudi Lake, Temple of Rukminidevi, Dharagiri Falls, and the night view of the point where the river meets the sea. Things to do in Galudi: Traveling the nearest tourist spots and taking walks near the waters of Galudi are the best things to do here. You can even take ample rest in the calm atmosphere of Galudi. How to reach Galudi: You can travel on road by taking the Bombay Road; you have to cross Kharagpur, Balibhasha, Chichira and Baheragora. After traveling for 5hrs and 30 mins on the National Highway 33, you can reach Ghatshila and then arrive at Galudi. You can also take the morning Ishpat Express from Howrah and reach Ghatshila after a 3hrs 20 min journey. 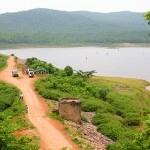 From here you can hire a car or auto-rickshaw and travel 11 km to reach Galudi. Best time to visit Galudi: Autumn is a lovely time to visit Galudi, due to the cool breeze, which will make you shiver. Though strong chilly winds play a major role in Galudi, winter is also a nice time to visit. Lodging and dining facilities at Galudi: Many resorts and hotels are available on the way to Galudi and Ghatshila. Dining facilities are also available in these hotels and resorts of Galudi. We are coming to Galudi to early October with our 6 & 8 year old children. We plan to pack in for 5 nights. What do you know about trail safety, drop-offs, etc. Please drop in your query through the Contact Pg, so that we can help you with your travelling queries to Galudi.